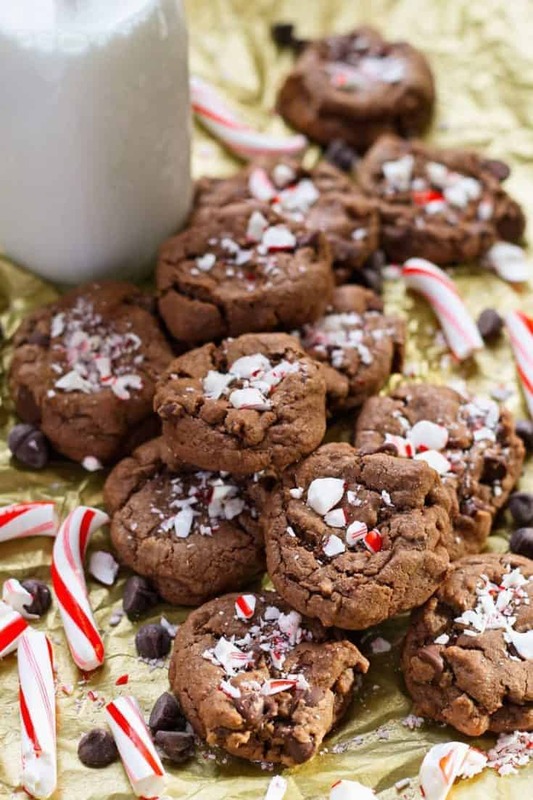 Use your extra or leftover candy canes to make these double peppermint chocolate chip cookies. 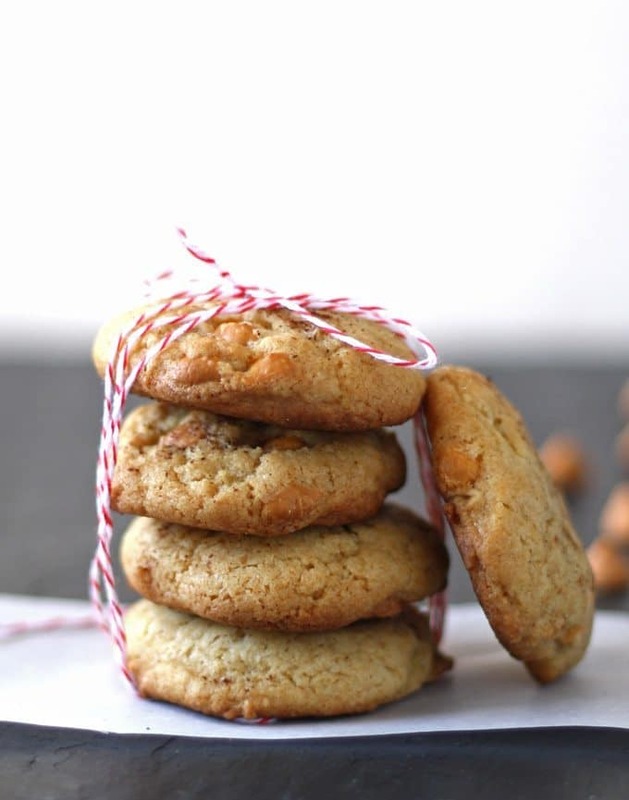 They are perfect for the holidays and cookie swaps! We are smack dab in the middle of holiday season and all I can think about are cookies. Lots and lots of cookies. 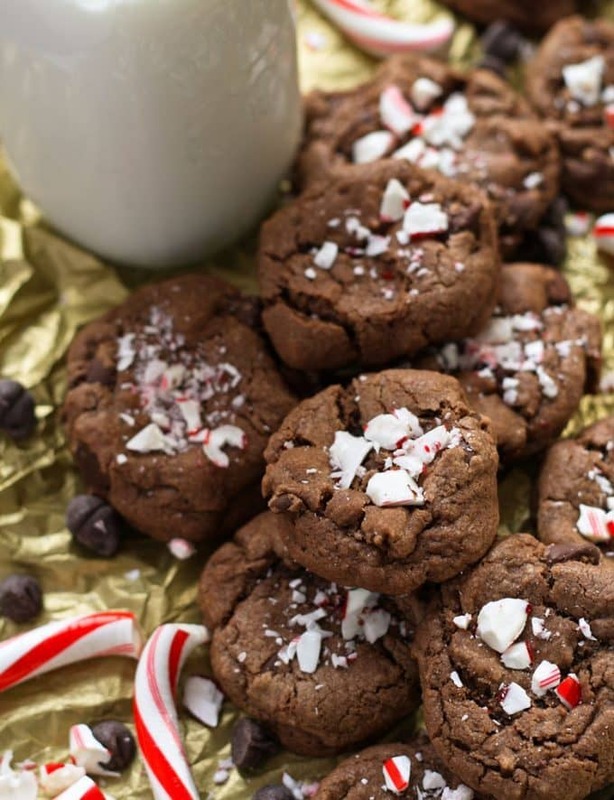 These double peppermint chocolate chip cookies are so so tasty. I just love when mint and chocolate are combined. In the summer, I eat it in ice cream form. In the winter, I’m all about the cookies. When I was a kid, I would eat all of the candy canes on the tree. Well, not the weird rainbow colored ones – I only liked the red and white candy canes. Now as an adult, we have stopped putting them on our tree because I’ll just eat them. To cut down on my candy cane eating, we now turn them into cookies. 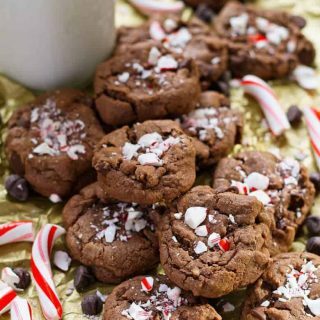 These easy cookies have twice the peppermint and twice the chocolate flavor for a double dose of Christmas goodness. The peppermint flavors come from peppermint extract and crushed up candy canes and the chocolate flavors come from cocoa powder and chocolate chips. I began stocking up on all four ingredients last Christmas so that I can make these cookies on a whim. Which means any cold day, I get an excuse to turn on the oven. Mix up a big batch for your next cookie swap or just because – we store some in a cookie tin next to the tea pot because you never know when you will want a double peppermint chocolate chip cookie. Or three. Pre-heat oven to 375 degrees. Line 3 baking sheets with parchment paper or silicone baking sheets. In the bowl of a stand mixer, cream together the white sugar, brown sugar and melted butter on high. When that is well-mixed, reduce the speed to low and add the egg, vanilla extract and peppermint extract. When this is well combined, slowly add the set-aside flour mixture until just combined. Then fold in the chocolate chips using a spatula. Using a tablespoon measuring spoon, measure out the dough. Place the cookie dough one inch apart on the prepared baking sheets. Bake for 9-10 minutes, or until the cookie edges look browner than the dough. Remove from the oven. 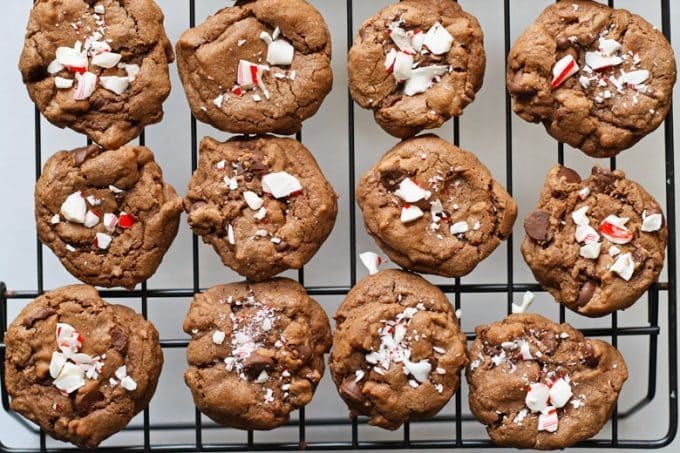 Immediately press the top of each cookie with a spoon or the flat side of a knife to flatten the cookie, just a little, and sprinkle the top of each cookie with a little bit of crushed candy cane. Let cool on baking sheet for 5 minutes, then let them finish cooling on a baking rack. 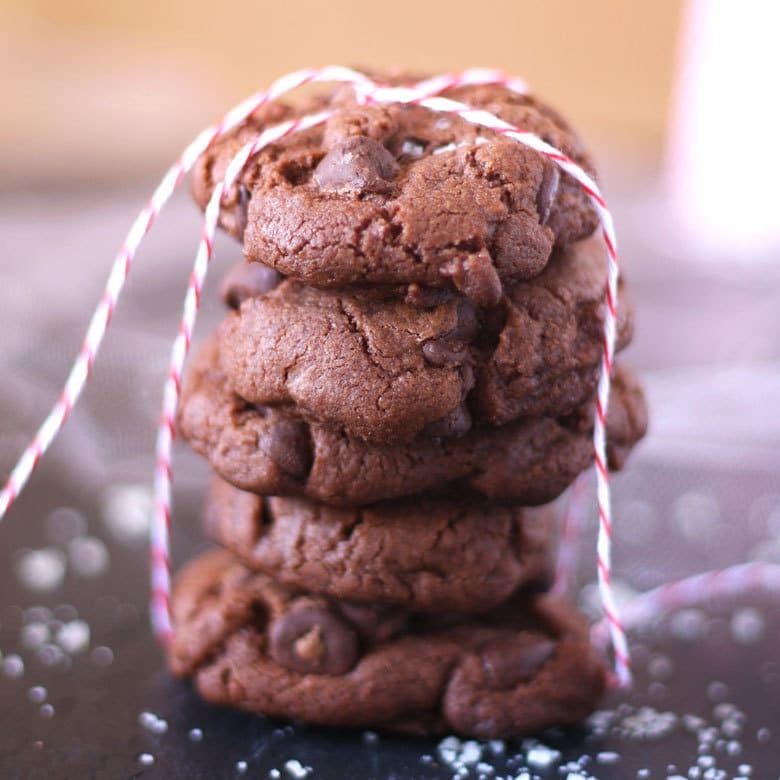 Try my sea salt double chocolate cookies! Or my butterscotch spice cookies. These look absolutely divine! 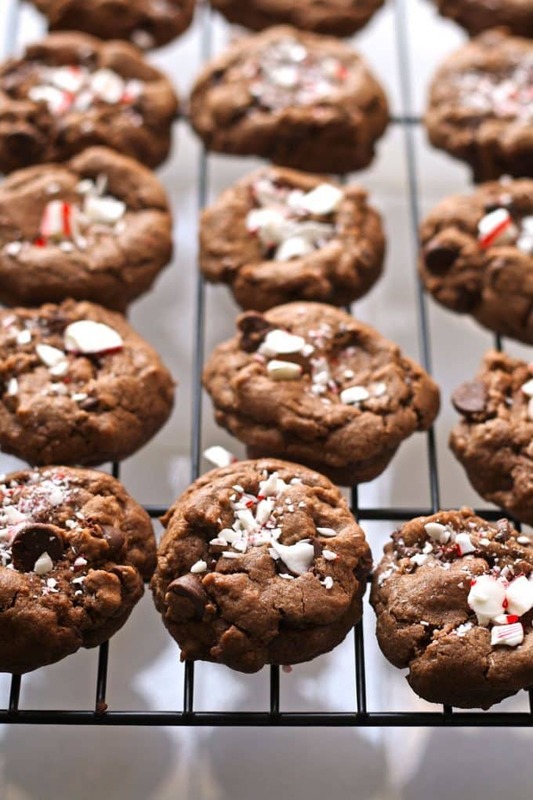 You can’t ever go wrong with peppermint and chocolate… especially double chocolate!